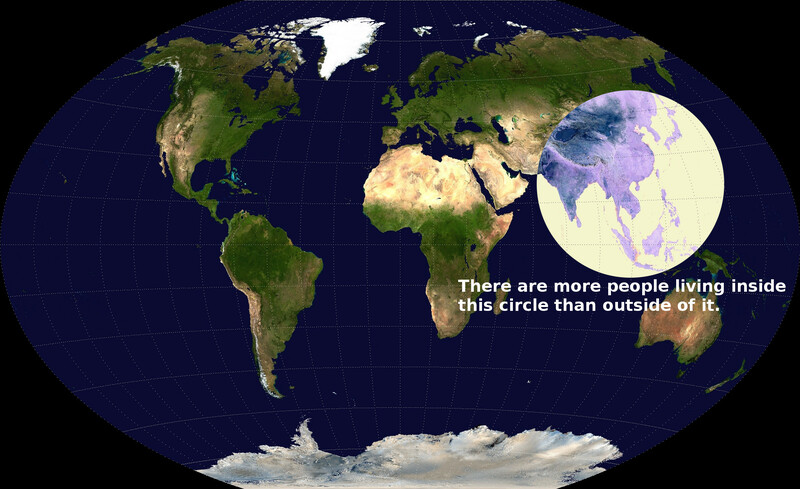 Recently, blog posts about “maps that will help you make sense of the world” (one example) circulated the internets and facebook. My current location in Indonesia, gives me a different perspective when viewing these maps than my friends from North America and Europe. When I saw that map, it didn’t change my world. I’ve lived in Indonesia a year and a half and during that time, haven’t been outside of that circle once, so, yeah, I know. But, Sumatra is less dense than Java, and I live in a rural area. This doesn’t mean the same as it does in North America, however. Even though Balige is a small town, on a day like today (which is traditional market day), the city is bustling. Actually, every day is bustling with people by American standards; life here is is more public. Nevertheless, it’s easy for me to walk about an hour to a village that is difficult to access by car. Here’s one that made me smile. This map (source), shows writing systems of the world. To my surprise, I see the Batak script listed there in Indonesia. I wasn’t surprised that there is a Batak script, rather that it was noticed at all. The old Batak alphabet, labeled on the map as “Surat Batak”. Although the old alphabet is not all that functional anymore in the lives of the Batak people, it does appear on some signs in the region around Lake Toba in North Sumatra (including the hospital across the street from me now). I am living in the heart of Batakland, so I regularly encounter the language Batak Toba–at the market, at my school (although all instruction other than my English class is done in Bahasa Indonesia), and in the church. Strong in their culture, it may seem living among the Bataks, that the language and the lake nearby is the center of the world. I love living here and am happy to see mention of the place where I live. 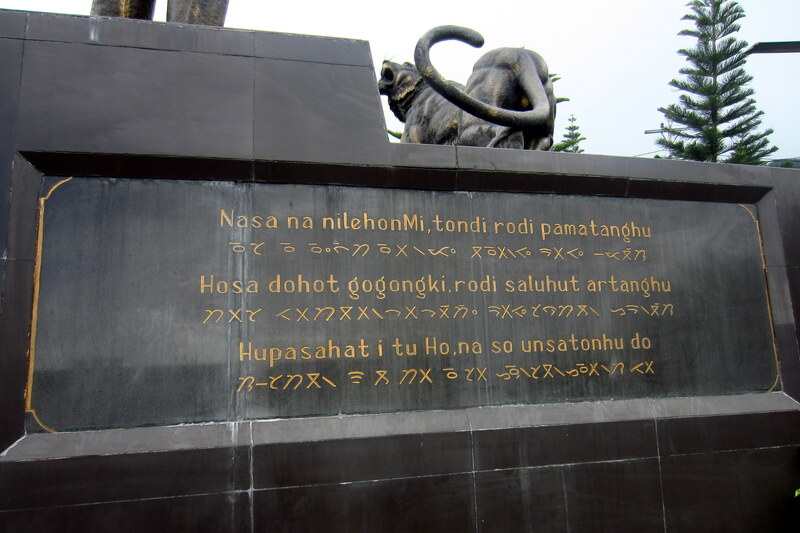 These days Batak writing uses the latin script, but below are two photos of the Batak alphabet in use. 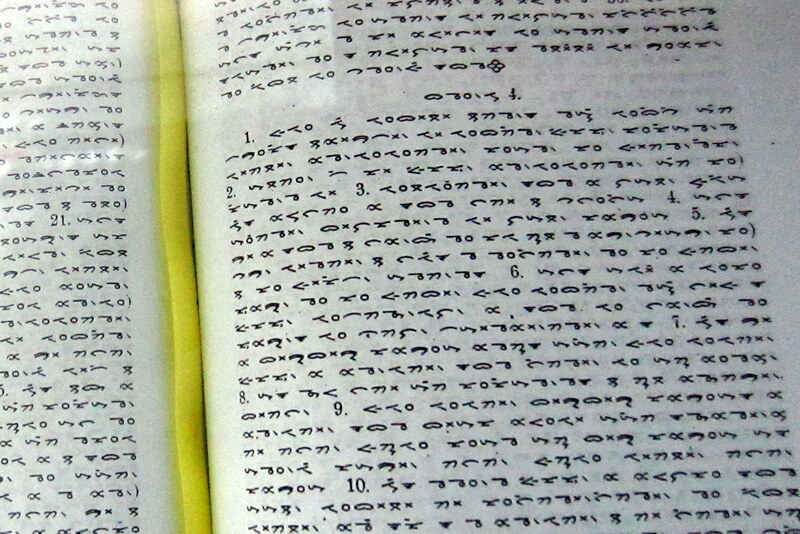 A Batak language bible written in the old alphabet, on display at the Batak culture museum in Balige, North Sumatra. Hello! I’m a foreigner married to a batak. I was wondering if you knew where I could formally learn batak. Like through a tutor or in a class maybe? Sorry I didn’t respond for so long. If you are in the US, I don’t think there’s an option unless you find a Batak person yourself willing to teach you. As far as I know, there is no Batak-English dictionary in print existence. There is HKBP Batak church in Denver, Colorado but I don’t know anyone there.